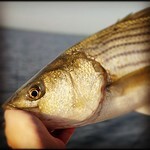 I haven't been on top of my blogging lately, but I have been fishing (reports to come soon)! Of course, fishing requires fly tying, and we are still having our monthly Chi-Tie social tying event for those in the Chicago area! Tonight at 6:30pm I'll be doing a quick demo of one of my flies, the "Mad Stripper." This fly has so much fishy motion and mojo, you'll want to tie a few. My buddy Dave over at Urban Assault Fly Fishing has some pics of the fly and a recipe over at his blog.